Jim Broadbent | The Reviewers Unite! You know, I don’t think people give James McAvoy enough credit. Sure he’s gotten a lot of critical success through the X-Men movies, but take a look through his filmography and you’ll see some serious acting chops. By far his most extreme character to date is the unhinged Edinburgh detective Bruce Robertson in this adaptation of the 1998 novel of the same name. Does Filth showcase McAvoy’s true acting prowess as well as the depths he’s willing to go, or is it a huge misstep for an actor in the prime of his career trying to prove himself by taking on the role of an unlikable prick? There’s only one way to find out, and that’s to keep reading! 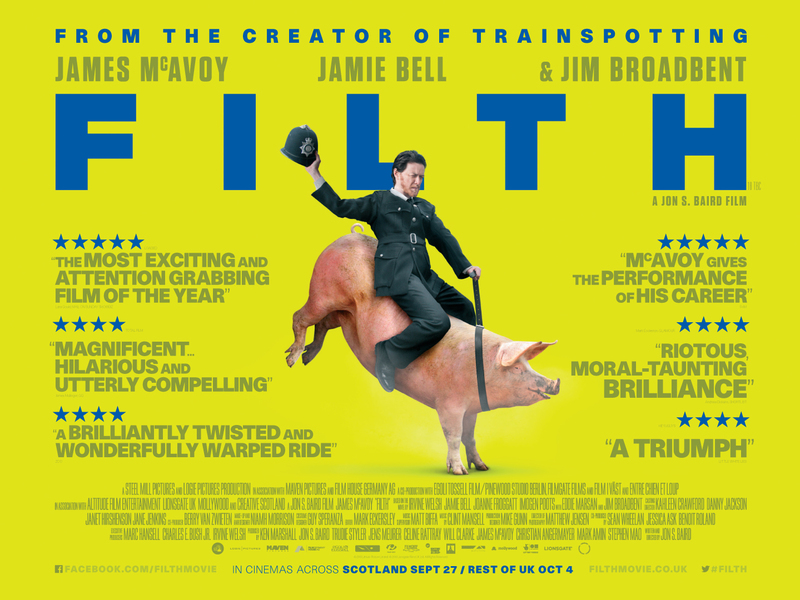 This entry was posted in Living on Netflix and tagged Eddie Marsan, Filth, Imogen Poots, James McAvoy, Jamie Bell, Jim Broadbent, Jon S. Baird, Movie Review, Netflix on September 18, 2014 by Matt Vetrano.